Mr. Pish the traveling terrier will help you stay organized in his own cute way with this 13-month personal planner/calendar loaded with photos of the precious and adventurous pup! 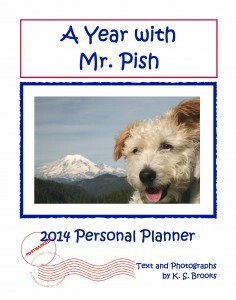 A Year with Mr. Pish is a funny, entertaining, and ADORABLE way to plan the year ahead. The pictures are fantastic, Mr. Pish’s narration is hilarious, and the planner is very user friendly…” – An Amazon.com reviewer. Want a hanging calendar instead? We have one right here!